Elmhurst, IL – There are many things to be thankful for this season, but the people with disabilities supported at Ray Graham Association’s Elmhurst Community Learning Center (ECLC) are especially thankful for their new handicapped accessible walkway and patio thanks to the generosity of Dan Wanzung, partner and landscape architect at American Gardens, and the Elmhurst Garden Club. When Wanzung learned about the Garden Club’s desire to create an accessible outdoor area he offered the club a blueprint of the backyard patio. “It was brilliant for two reasons,” said Teri Litavsky, Garden Club member. “One is that it was a beautiful design. The other reason is that the majority of the patio is permeable and can soak up water in heavy rains or when the snow melts”. 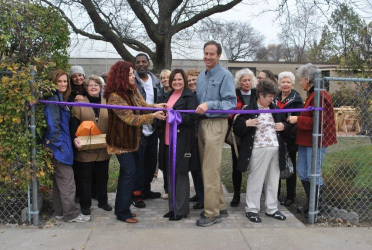 On Tuesday, November 15 at 11:30 am, the Elmhurst Garden Club will host a ribbon cutting ceremony that will also honor Wanzung for his contributions to the project. The ceremony will be held at the Elmhurst Community Learning Center at 420 W. Madison in Elmhurst. Ray Graham Association is a non-profit organization that supports nearly 2,000 children and adults with disabilities in DuPage County and the surrounding areas. They provide residential, educational, life skills, recreational and family support services. Visit www.raygraham.org for more information.